3397, Used Rims, 17X7-1/2, 5 LUG, 135MM, 00-04, FORD, F-150, EXPEDITION, HERITAGE, CLEARCOAT 5 SWIRL LIGHT SILVER TEARDROP POCKETS, 14MM WHEEL BOLT, 16MM BOLT HOLE. 3399a Used Rims 16X7, 5 LUG, 135MM, 00-04, FORD, F-150, HERITAGE, ALUM POLISHED FACE, CLEARCOAT, 5 SWIRL SPOKES, COMES 12MM & 14MM. NOT RECOMMENDED TO CHANGE THEM. 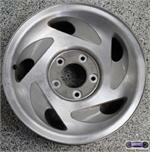 3399b, Used Rims 16X7, 5 LUG, 135MM, 00-04, FORD, F-150, HERITAGE, ALUM POLISHED FACE, CLEARCOAT, 5 SWIRL SPOKES, COMES 12MM & 14MM. NOT RECOMMENDED TO CHANGE THEM.